With animal print everywhere for fall this is one trend that Adrienne of The Rich Life (on a budget) and I couldn’t resist covering for October’s “How I Wear My”. But does it really qualify as a trend? We see it more as perennially popular but especially big right now! 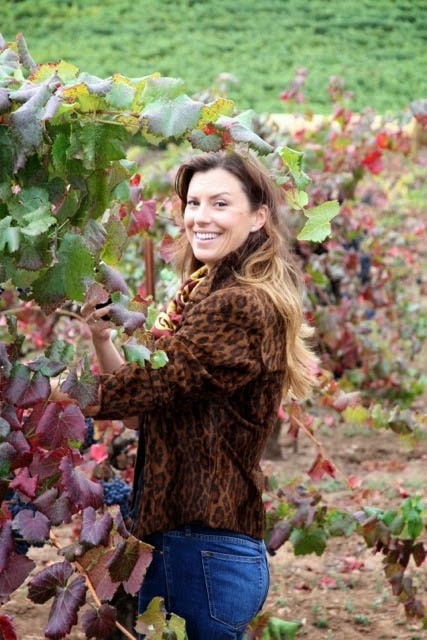 Adrienne, above, of The Rich Life (on a budget), my gorgeous “How I Wear My” partner, jokingly said of her look, “Here I am just traipsing around a vineyard in leopard and Hermès, like I do all the time.” Sounds like heaven! Her jacket was purchased in the late 1990’s—hooray to closet longevity!—and I can understand why she says it’s her favorite. She paired it here with a lovely Hermès scarf. What a great look. One of those wine connoisseur magazines ought to use this picture as their cover for October! I love Teresa in her Gucci python heels. Smokin’ hot! Photo by Denton Taylor. Oh that Teresa is a lucky gal! And do note her sunglasses, which are from the recent Prada collection inspired by hot rods. I love this look so much, the gray leopard and green really pop when put together. Mama like! I am deeply dying over this look, it’s so very Sunset Boulevard. Gloria Swanson had nothing on Judith! Do check out the latest edition of Style Crone’s very fun Hat Attack series. Tori of Healthy Food Nerd. Tori of Healthy Food Nerd is wearing a leopard maxi dress from H&M and looks absolutely stunning! What I especially love here is you know it took her literally one second to get dressed. I never get tired of that kind of fast fashion! 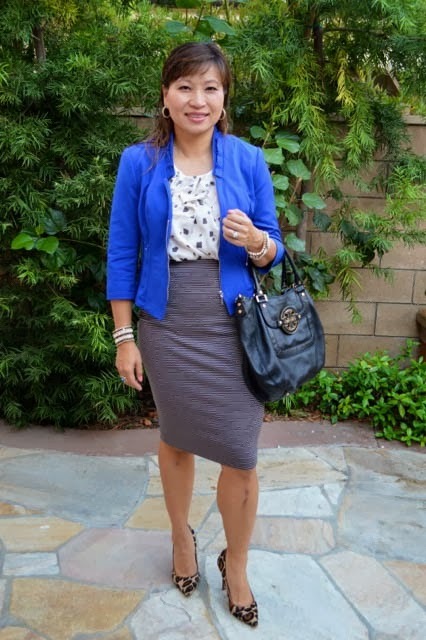 Suzanne of Suzanne Carillo Style Files sent a photo I want to call “My Blue Heaven” because of the gorgeous combination of a baby blue leopard sweater worn with a deeper blue lace skirt. Perfection! 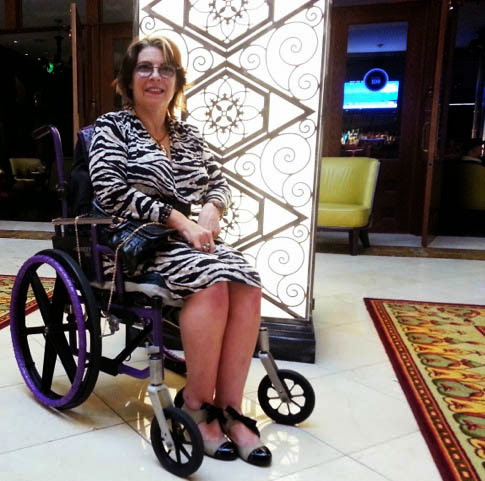 Alicia of Spashionista wears a fantastic zebra stripe dress with a pair of black and beige cap-toe Mary Janes. Zebra is one of those prints I adore but currently don’t own. Alicia’s outfit makes me want to change that, pronto. Alice of Happiness at Mid-Life added a pair of Sam Edelman leopard pumps to her ensemble, which I love. Don’t you think the leopard and the blue jacket make the whole outfit pop? I love it paired with textured tights and T-strap heels! Silk Path Diary in a snakeprint skirt. Ha, as long as she doesn’t try to wear any of it to zoos in England! Did you hear about a British zoo banning animal print because it confuses the animals? So SPD, do NOT wear that great skirt to the zoo, we don’t want any snakes to get confused! And do not get me started on that bag, because we will be here all day. I don’t know about you, but I always love to see how Sheree of It’s Not That Deep is mixing it up in what she wears. 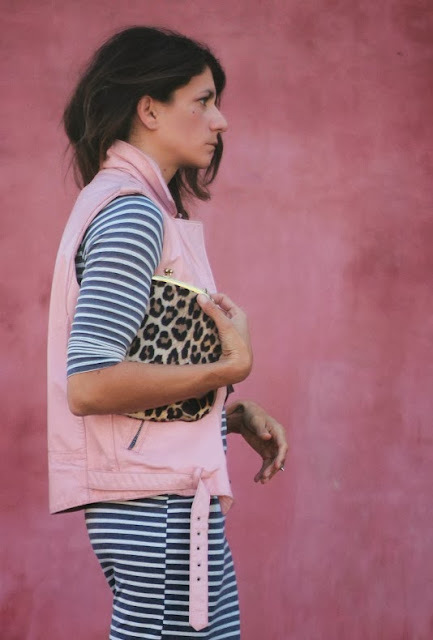 How could I not fall for this combination of stripes, pink vest and leopard bag? My mom in a sheer leopard print scarf. My mother said this sheer gray leopard print scarf was a gift from her brother and sister-in-law about twenty years ago. It still looks great and proves the point that animal print never goes out of style. I love it paired with that particular shade of blue. Way to go, Mom! She is wearing this very ensemble right now on her trip to London. Deja of Une femme d’un certain âge is wearing an Equipment blouse with little Eiffel Towers all over it (love! ), a Chanel necklace (double love! 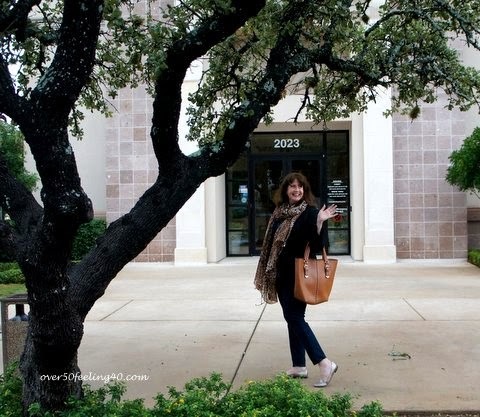 ), Eileen Fisher jeans and a pair of leopard pumps, which help kick the whole outfit up several notches. I love this entire ensemble, don’t you? 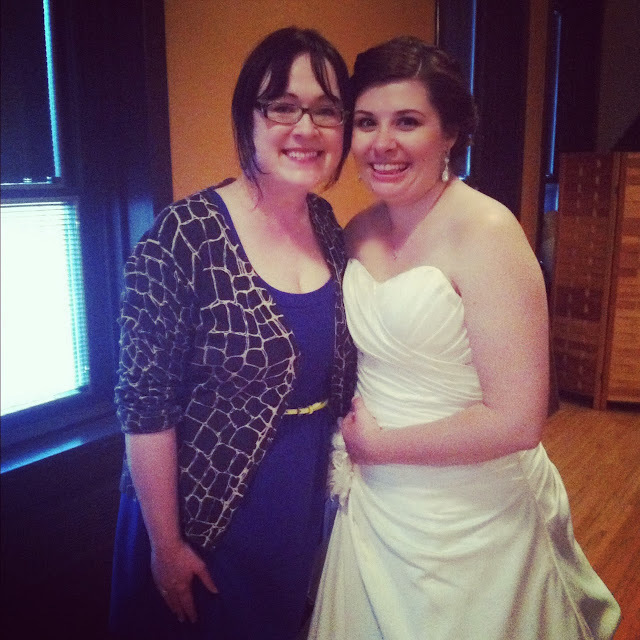 Haley of Cheap Recipe Blog next to one gorgeous bride! Haley of Cheap Recipe Blog wears a great croc-print cardigan with a deep blue dress and a cool skinny belt as she stands next to a glowing and beautiful bride! Oh Christina, you had me at leopard and Louvre! I think this is an ethereal and gorgeous shot, with the lighting and sculptures and lovely Christina in her black blazer with leopard peeking out. J’adore! 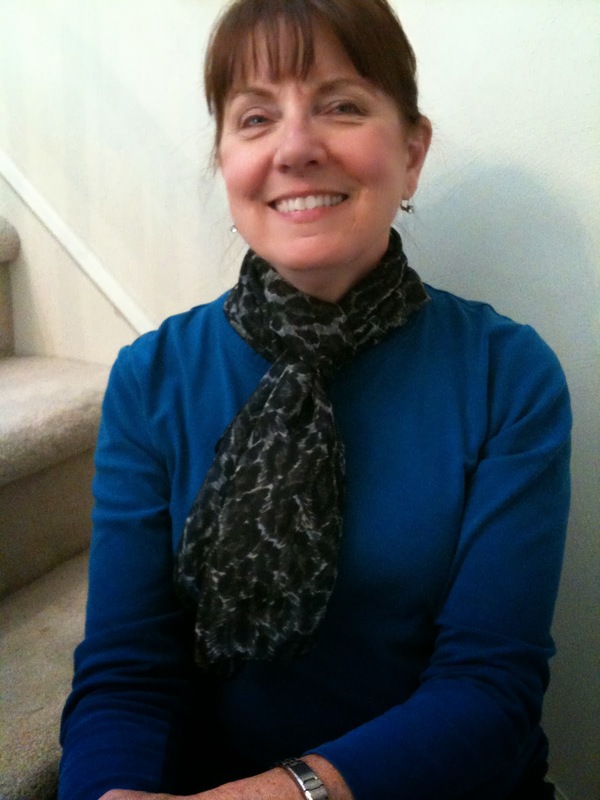 Pam of Over 50 Feeling 40 wears a scarf sent to her by Chico’s. It was designed in collaboration with Harper’s Bazaar and sales of it benefited Stand Up To Cancer, with $10 of every sale going towards cancer research. The scarf proved so popular that it is now sold out! I like that idea—animal prints as a neutral. Great styling advice! Anne of Music and Markets. Doesn’t this picture feel like a still from a movie starring Romy Schneider? Sounds like the perfect vacation, right? 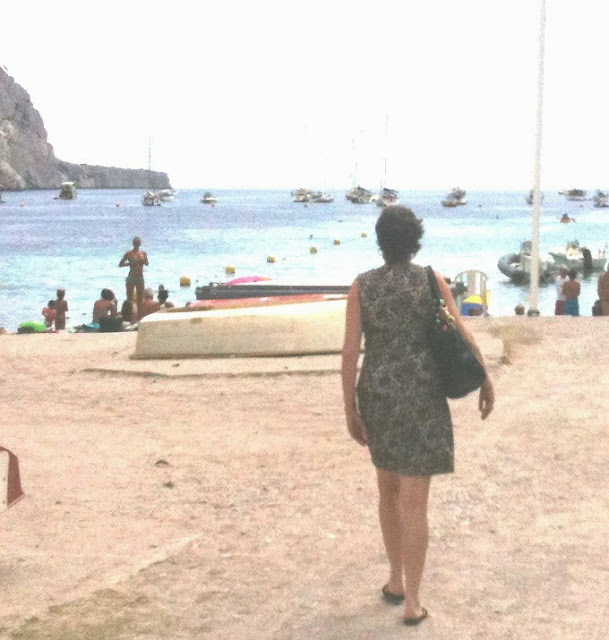 Animal print and the south of France? Count me in! Hello Kitty! 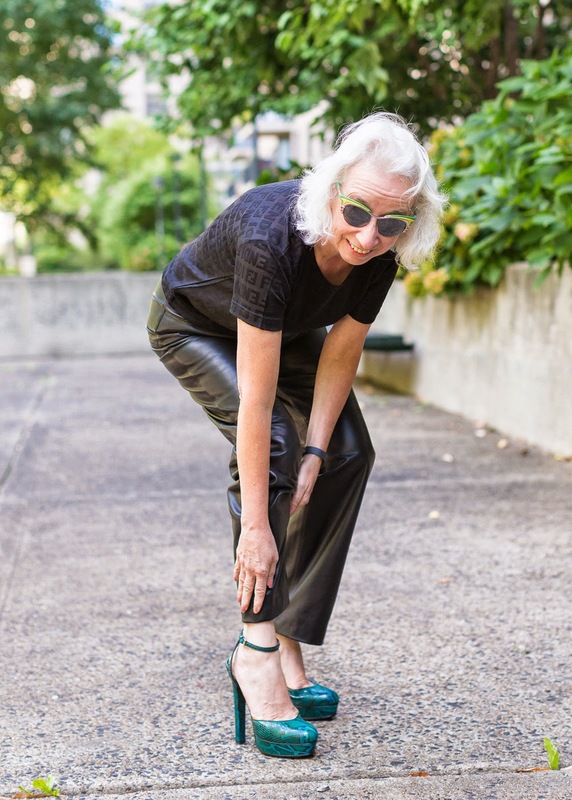 Paula of Fashion Over Fifty shows us a collage of leopard. 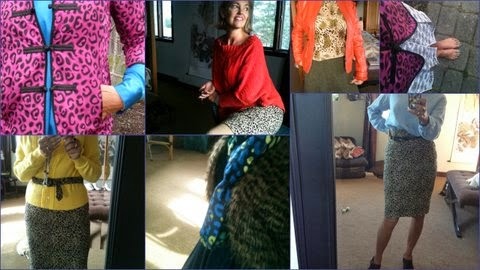 Paula of Fashion Over Fifty sent us this great collage showing all the different ways she wears leopard. If I have to pick a favorite it would be the hot pink jacket. How about you? Leopard cardigan by J. Crew. I’ve always gravitated toward leopard print so there was no way I could pass up this J. Crew cardigan when it went on sale a few years back. I love its unusual color, and especially the pops of blue throughout. Another J. Crew cardigan, worn with a snakeprint infinity scarf. Snakeprint is another favorite of mine and I wear this infinity scarf given to me by my mother-in-law so much. If you see me taking my daughter to school this fall there is a good chance I will be wearing this exact combination! Do you favor one kind of animal print over another or do you love them all equally? The temperatures are beginning to drop and it’s time to say goodbye (for now) to shorts, capris and summer dresses. And while that can be a little sad doesn’t it feel great to welcome back the denim that has been ignored in your closet for the past few months? If you love denim as much as we do then please join us in November for “How I Wear My: Jeans”. Whether you prefer them skinny, bootcut, boyfriend, pegged, cropped or flared, whether you like high-rise, low-rise, sailor-style or overalls, whether you love them printed or in color or just as true blue as they were originally made, we know you have at least one pair so show us how you style your jeans! You can send a picture to Adrienne, me, or our email account howiwearmy@yahoo.com by November 5. Head on over to Adrienne to see even more animal print looks. And thanks to all the fine foxes who participated this month! Fantastic looks from everyone! 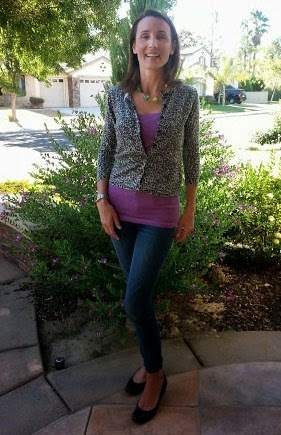 I think your cardigan is perfect and so versatile - I should have one :-) Thanks so much for featuring me. 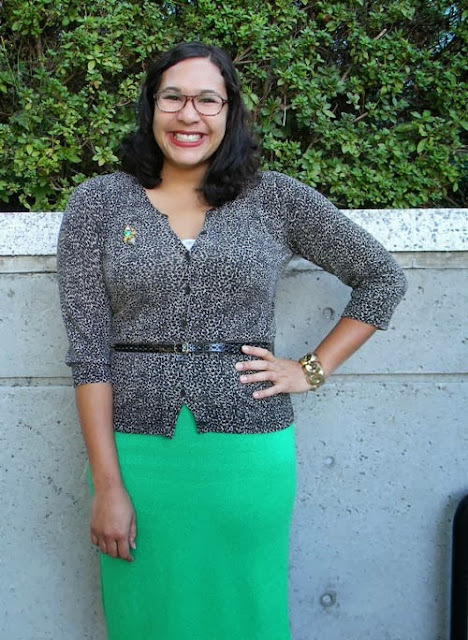 I'm so inspired by everyone's looks and no, I won't be wearing my snake skirt to the zoo - ha! I just commented on Adrienne's blog thinking it was your post. Don't ask. Everyone looks fabulous! Animal prints are so enduring, yet look so fresh. Great round up, Jill! Is that your home, Jill? Love the big porch and you look great in your cardi!! This was a fun gathering of stylish women!! Fun, fun post, partner! I love seeing all the different prints on everyone. Teresa's shoes are amazing! I didn't realize they had an ankle strap. And I love your cardigan. I bet it's very versatile. Looking forward to jeans for November! Love it! Thanks for posting my picture and all of the others. Such great inspiration here - I love, love, love animal print! Everyone is looking great! Thanks for showing Teresa again. Your porch photo looks fabulous as does that of Deja! This is my kind of HIWM! I love animal print and looking at all these fabulous outfits gives me tons of ideas that are perfect for fall. Thanks you, Jill and Adrienne, for hosting such a wonderful group of ladies. I LOVE YOUR LOOK! As well as all the other lovelies- but you look fresh and chic and amazing in that sweater. I think leopard is my go-to mew as of late- but that wasn't always the case- in the past it was most likely a zebra- but the warm browns of the big cats just feel so much more uh subtle? Something- that I love in my wardrobe! Thanks for hosting! I do love that cardigan of yours! 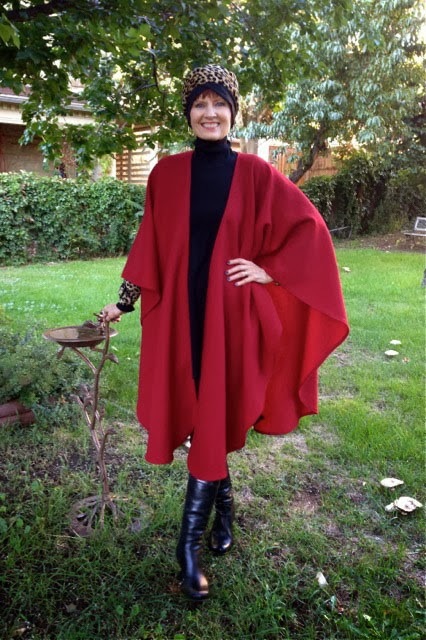 And I love all the looks--its a true test of a classic--look how many different styles and people it can handle! I do OD on it tho; I get sick of it and then leave it for a few. But always keep the clothes because you know it comes back in style! Great looks by everyone! Thank you for hosting such a great series! I'm glad you posted a photo up close of your cardi because I wasn't able to see the bits of blue throughout. It is lovely. That is too funny and weird about the animals at the zoo being confused. Jill, you look so wonderful in your cardigan!! What a beautiful touch with the blue...how did I miss seeing it? Was it lots of grand kiddies???? Fantastic post with lots of lovely ideas--I feel a shopping trip coming on....maybe I should take a break from touring castles & palaces & 'tour' some London shops! Thank you both so much for always curating these amazing collections of style. I was never much of an animal print person until quite recently. And here I am inspired to try some new ideas. Lovely to be included, as always, with so many wonderful looks. 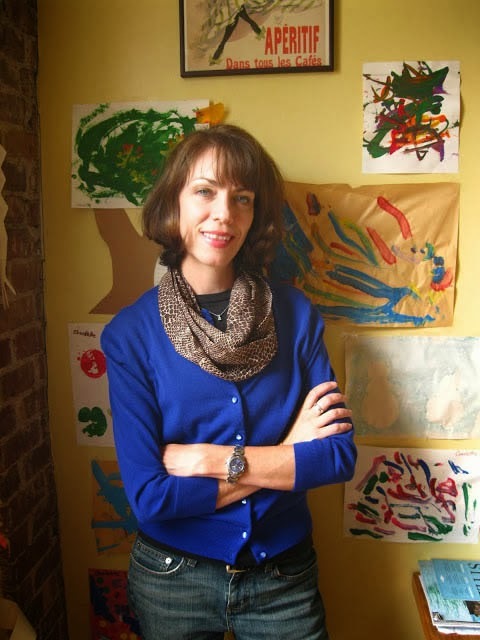 Love your cardi, Jill, and the scarf, too! How much fun is this! Thank you for hosting this animal print party. Love the self expression and individuality! Jill, This is the best one yet! Loved everyone's looks. So many stylish women. Your J Crew cardigan is the best. Wish I could find one. Everything about it -the color, design is gorgeous. I like it with the white jeans right now also! next time I will send in 2 photos so I could be on both of your blogs. Didn't know I could do that. Love it, esp Tamera's leopard flats. 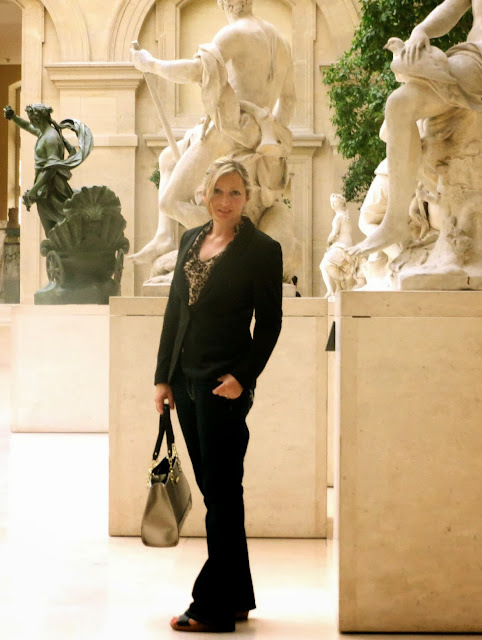 Stopping by via Heather's Stylemindchic. I'm just catching up on all my favorite blogs today. The animal print styles are so much fun. I'm a big fan and they never go out of style in my book. I can do all the animal (but never the reptile-phobias-don't ask ;). Great series and thanks for hosting darling! You ladies are all so beautiful and inspiring. I keep scrolling through your HIWM posts trying to gather enough courage to participate. Keep shining and stay fabulous!